Twins born to Asaf and Eric! 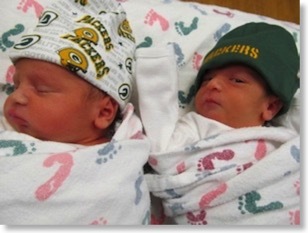 Congratulations to our NY group members Eric and Asaf for the birth of their boy & girl twins on January 13, 2012! Oz & Amalia are doing great and the family hopes to be back in NY by the end of the month. We are full of gratitude for the support and advice we got from our friends and family, the medical advice and care from the Maternal Fetal Care and the Birth Centers at Froedtert, and the two amazing women who made all of this possible- you will forever be part of our families.